Hi everyone! Today I have a mini cookie jar to show you. I bought a set of these Ball brand jars at the grocery store (Giant)...four jars for $4.29. Hey, that's just a little over $1 a jar!! I decorated all four of them so my youngest daughter can give them out. The stamp is from the SASI Love is Sweet set. The Enchanting DP and gingham ribbon are also from Taylored Expressions. 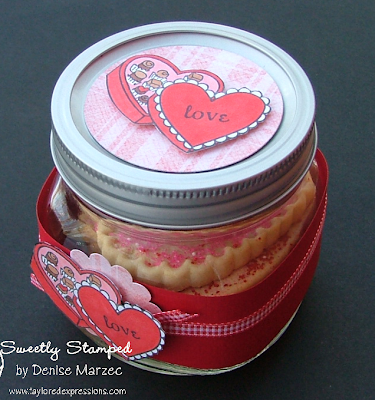 The jars are filled with heart-shaped sugar cookies. I cut a piece of 1.5" x 12" textured red CS, wrapped it around the jar, and taped the edges down with sticky tape. The edges didn't quite meet so I punched out a scallop circle from the DP and layered that over the red CS. Next, I wrapped some of the red gingham ribbon around the entire jar. 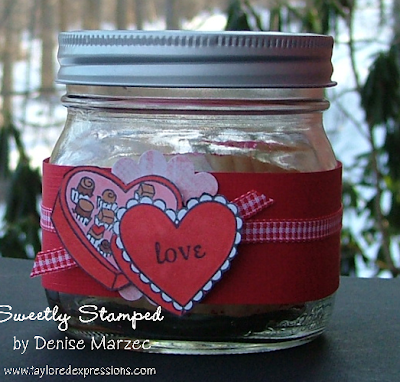 The last step was to add the stamped candy box from the Love is Sweet set, which is popped up on Dimensionals. For the top o f the jar, I cut out a circle in the DP with one of my circle Spellbinders dies and then added a second candy box. This candy box is also up on Dimensionals. I made the jar to go with a card I made last month. Here's the set. what a cute idea, I bet your daughter will be proud to give these goodies out & they will love 'em! How adorable, Denise! What a cute little jar! Awww, too, too cute, Denise...what a wonderful idea for Valentines gifts!!! I love the image and the wonderful papers...gotta love those heart shaped cookies, too!!! Totally cute - Denise!!! The jar is a neat idea and so yummy looking!!! Super cute Denise! What a nice treat to hand out! Adorable Denise! It would be so perfect for a teacher Valentine! Adorable cookie jar, Denise!! I'm sure your little one will just love giving these away. Great Valentine project. Cute!! What a great idea! I think I'll have to pick up some of those jars next I'm at Giant to have on hand for a quick gift! What a fabulous ensemble!! So cute, and yummy at the same time!! What an adorable (and yummy) set, Denise. Love these colors together. What a super cute set. Love the great colors and that image. I love chocolate. :o) TFS! Super cute Denise! I love those jars and always love to see what can be done with them! Great idea!! Love how perfectly it coordinates with your card - and what a deal on those jars!! This makes a beautiful gift!